My aunt's sister recently passed away. While I only saw her twice in my life, I could tell she was a wonderful person. 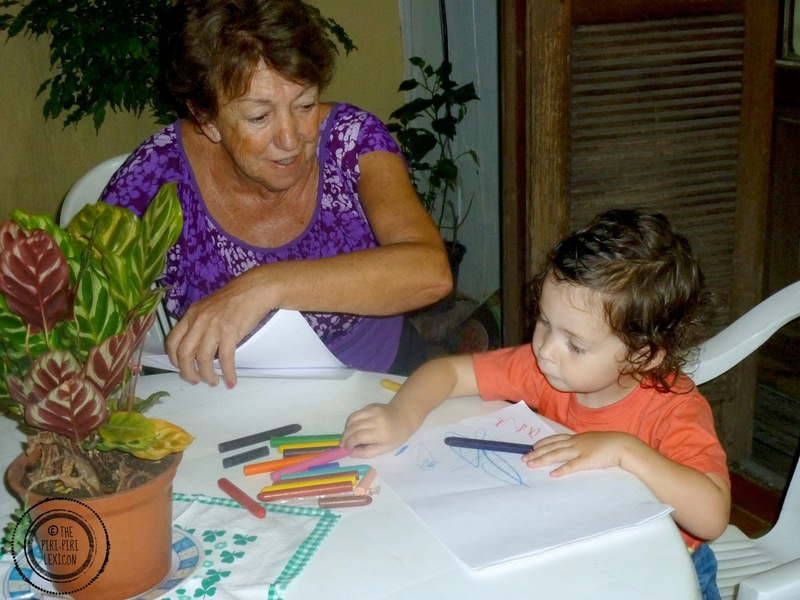 She worked with deprived kids in Brazil and lived her life to the full right until the end. The last time I met her, she played the babysitter to LJ while we were visiting far away family in Brazil. I am really glad my daughter got to meet her even though she may not remember her. The first time I met her she visited my family in France when I was still a teenager. 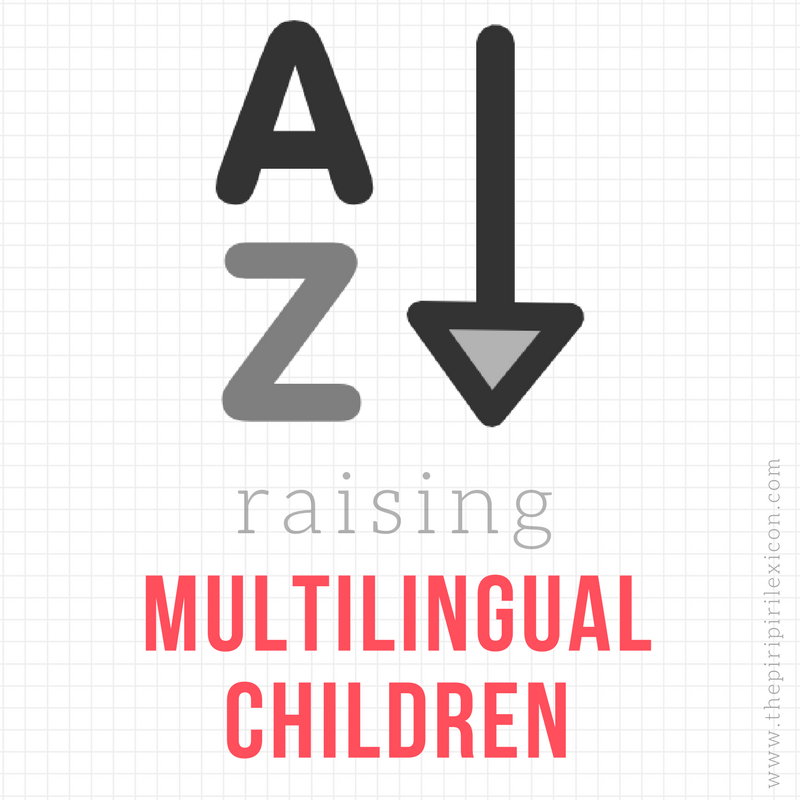 As neither I nor anybody else in the family spoke Portuguese (then), she and I conversed in basic Spanish. She was really grateful to have someone who could understand her in the family. One thing that I remember from that first encounter was her walking around rural France with a beautifully-decorated metal mug of herbs! She took it everywhere. We all found it a little odd until she explained what it was. 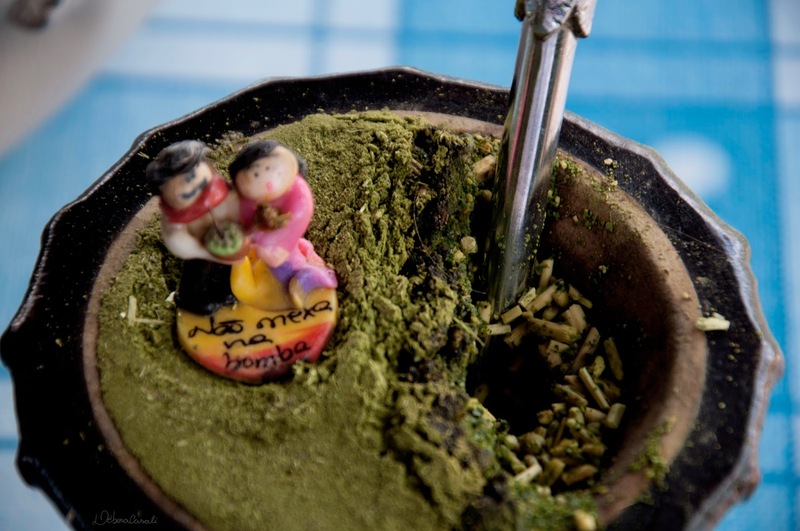 You may have heard of erva mate (or yerba mate) which is an iconic drink in Southern South America. Mate is a plant not unlike holly. It is cultivated in Argentina, Paraguay, Uruguay and the southern states of Brazil. The leaves and twigs are used to make tea. The tea is rich in caffeine but has also been linked to some types of cancer (albeit non conclusively). The teas vary depending on the region and the culture of its makers and drinkers. In the regions where it is drunk, mate is as culturally significant as coffee is in Italy or as wine is in France. It is not just a beverage, it's a social and cultural unifier and identifier that cross national and linguistic boundaries. Some versions of mate are sweet, others are very bitter, some use fresh leaves, others dry. 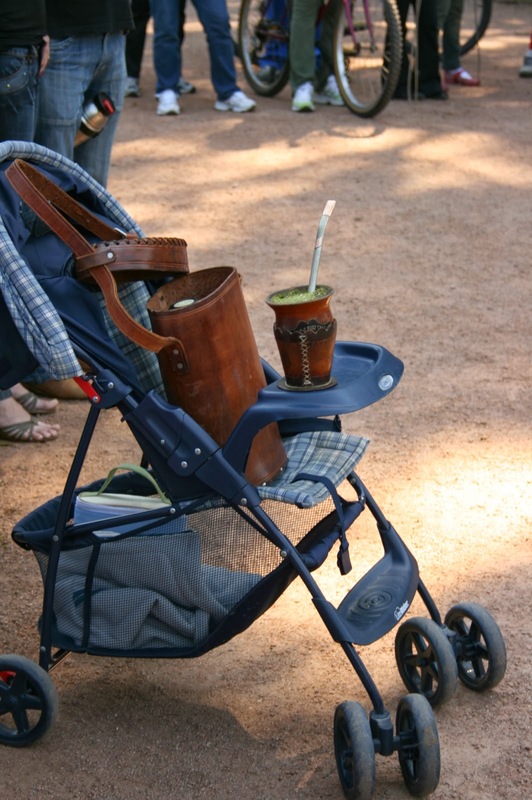 In Brazil, in particular, gauchos drink mate. Gauchos are the inhabitants of Rio Grande do Sul, a southern state of Brazil, but also used to be cowboys. 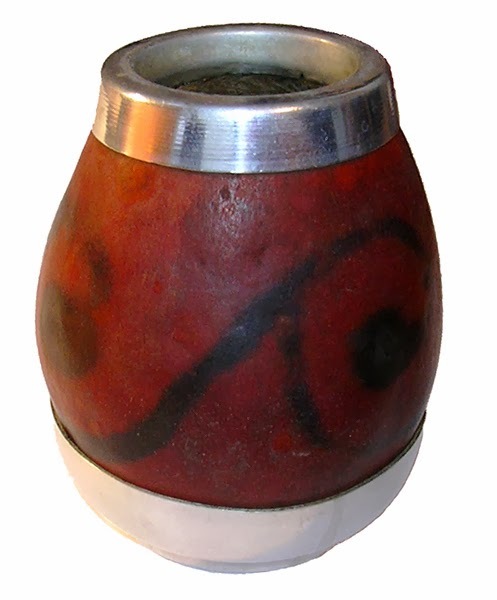 Part of the gaucho identity is to drink mate, often all day long. There mate is drunk in the form of a chimarrão drink. 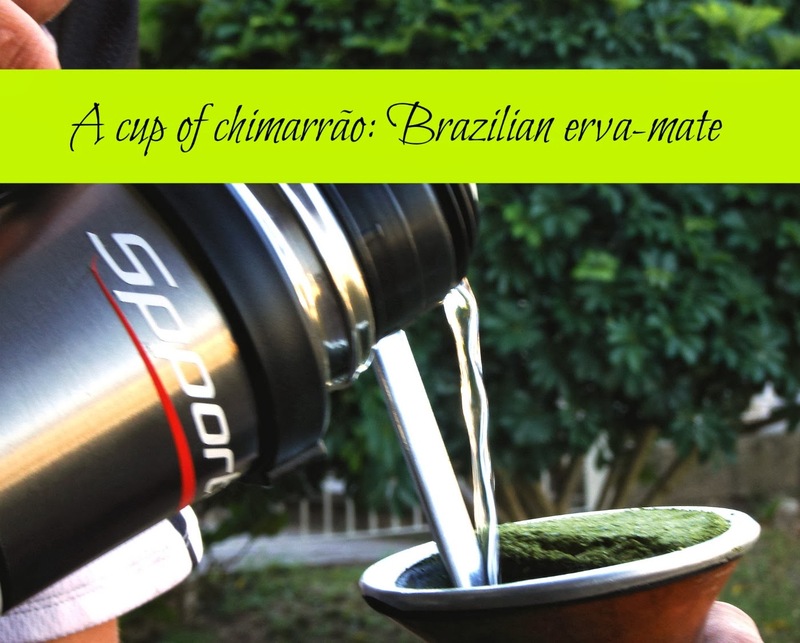 Chimarrão is made up of dried leaves and stems of the erva-mate plant in hot water. While walking down the streets of Porto Alegre, the largest city of Rio Grande do Sul and my aunt's city, you can spot people carrying their little cup. In the park, in a bus, at work, in a shop, everywhere... The tea is drunk in a a cuia and through a bomba. They often also carry in a bag a thermos full of hot water for regular refills. The cuia is a kind of rounded cup/mug often decorated with silver or gold. 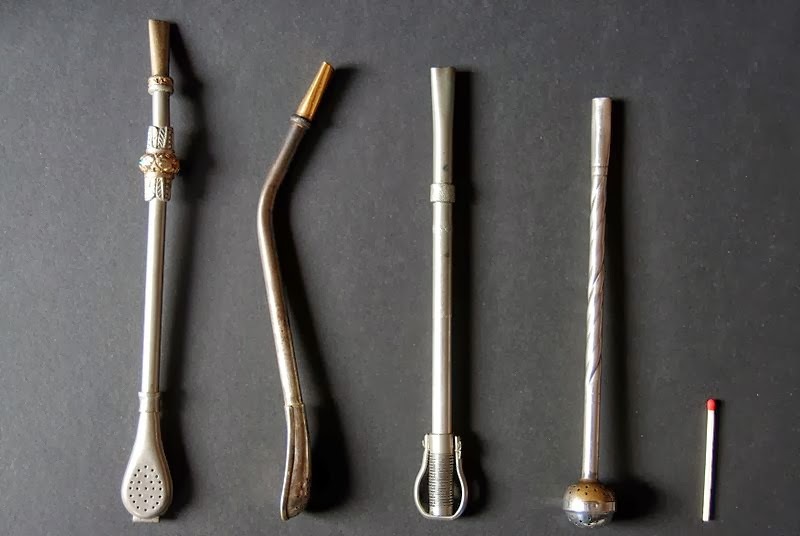 The bomba is a metallic straw with a filter at the end to avoid leaves getting in. There is apparently a ritual with drinking chimarrão with others. The person who is offering the drink, must be the first person to pour hot water over the tea, and also the first person to drink. The first infusion is the strongest, and can be bitter. When he or she has drunk all the chimarrão he must refill the cuia with hot water from the thermos, and pass the drink and the thermos to the next person. That person in turn must drink all the chimarrão, then refill the cuia and pass it to the next person along with the thermos. I, personally, never managed to finish one cup and excused myself as I found it extremely bitter. Have you ever tried mate? Did you like it? Personally, I can't stand the stuff. But I think my problem is the metallic taste of the straw or 'bomba' as much as anything else. You don't see many people drinking it here in Curitiba, apart from the lost Gauchos. Furhter south, though, it is definitely a way of life. You're right maybe it is the taste of the metal I couldn't stand.... I didn't really like it either and certainly couldn't imagine myself drinking it all day long. This looks so interesting, I'd try it for sure. I love trying new things like this when out and about. I'm not Brazilian but have drank mate for a number of years after being sent some as a gift by some 'Gauchos'. The taste initially is not a nice one but this soon changes and the flavour becomes very moreish! I genuinely do feel a difference in myself if I drink it regularly for a few days and find it very relaxing. I wish it was more commonplace here in UK. I'm drinking some right now. Unfortunately I can't find a Cuia big enough like I saw when I was in Brazil, so for now I'm simply brewing it in a coffee maker. Big, bold, and bitter.